AAHA stands for the American Animal Hospital Association. Only 15% of animal hospitals in the United States and Canada are accredited, and we are one of them! This means that our hospital exhibits an exceptional level of veterinary care and client service, based on AAHA’s Standards of Accreditation – a list of over 900 standards! We have been accredited since 2012 and have kept our accreditation current through periodic re-evaluations. Learn more about AAHA here Click to learn more! We are a proud 11 year member of the Ruston Lincoln Chamber of Commerce! We appreciate all of the support we have received from the community. We have also been the Peach Festival Parade Sponsor for the last three years. We accept online payments through Care Credit. Click HERE to pay online. We recommend Care Credit as a convenient payment plan option. Care Credit provides a credit line for you to use at more than 150,000 enrolled healthcare practices, ranging from vet care to dental care to eyeglasses. It is easy to apply, and you’ll receive an answer almost immediately and will be able to use your account right away! We offer a 6 month payment plan through Care Credit, which means you have 6 months to pay in full through Care Credit before interest is charged. Minimum monthly payments are required. Care Credit is great to have on hand in case of an emergency or unexpected vet expenses! To apply for Care Credit, visit www.carecredit.com and fill out the application online, or call 1-800-365-8295 (must be 21 or older to apply). 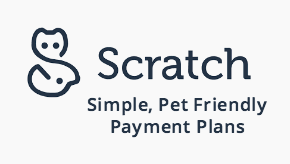 We also accept Scratchpay, another payment plan option. If you are looking for a GPS device for your pet, the Whistle may be just what you need! The Whistle Pet Tracker attaches to your pet's collar and uses real-time GPS technology to help you find your pet if he gets lost. The Whistle Pet Tracker also tracks your pet's activity, sends you alerts, and more! Find out more at the Whistle website HERE. "Give your dog a lift with the orthopedic support and comfort of a patented chew proof design. Dogs are kept cool in summer months because of air circulation underneath the bed and are lifted up off cold hard floors in the winter. Our cot-style dog bed is a relief for dogs' joints and easy to clean. Choose the frame and fabric that is right for your dog! All Fasteners are Stainless Steel. Manufactured in the USA."